This product protects your propeller. It is a clear anti-abrasion boot that is bonded to your propeller's leading edge. Virtually all propeller failures are caused by sand and stone nicks to the leading edge, and this is precisely what Prop-Guard is design to prevent. By acting as a resilient barrier between the leading edge and the sand and stones that cause abrasion, the life of your propeller is increased and maintenance is reduced without sacrificing performance. Best of all, Prop-Guard is easy to install. It only requires about 20 minutes. It is much easier and more economical to protect your propeller blades with Prop-Guard than to continually file, dress, paint and balance your blades until they must be replaced. Prop-Guard is STC and FAA-PMA approved and has been rigorously tested to stringent FAA standards. 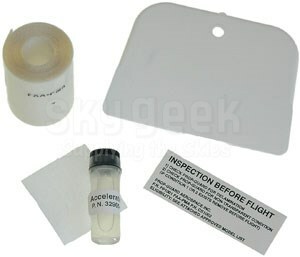 The FAA has determined that the installation of Prop-Guard laminate is a minor alteration because it does not appreciably affect the weight balance, structural strength, performance, powerplant operation, flight characteristics, or other qualities of the propeller that affect airworthiness, and it may be done according to accepted practices that involve only elementary operations. Accordingly, the installation of Prop-Guard laminate may be performed by a certificated mechanic under sections 65.81 and 65.87 of the Federal Aviation Regulations, and does not require the completion of a Form 337. It's NOT just a piece of tape!